The holiday season is upon us and instead of looking forward to spending time with family and friends some of us think, “here comes the weight.” So why do we add on weight during the holidays? Is it all the yummy food or all the added stress? Studies show that when people get stressed they either skip meals and overindulge later, or they engage in “emotional overeating” to temporarily distract themselves from the negative emotion. Neither way is a good way to handle the stress of the holidays. So, what can you do to manage your stress and get through the holidays without gaining those extra unwanted pounds? You don’t have to be happy and full of cheer all through the holiday season. If you start to feel stressed, sad or depressed, express to others how you feel. If you start to feel blue, try socializing and connecting to others through community events or volunteering. Don’t set your expectations too high. Not everything has to be perfect. Set realistic goals for yourself and understand that unexpected events may necessitate a little flexibility. Accept people for who they are. This is not the time to try to change someone. Set differences aside for after the holidays. 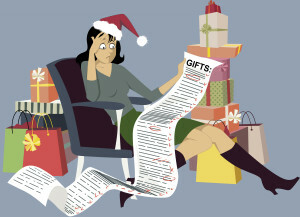 Before you set out on that shopping trip, establish a budget and stick to it. You can’t buy love, after all. Organize all your activities—one day for shopping, another for baking, and then time to spend with family without feeling overwhelmed. Know your limits and don’t try to be the person who can do it all, because it will leave you feeling tired and stressed. Ask for help and say “NO” when you need to. 8. Don’t abandon healthy habits. The holidays are not a time to forget about your health. Continue to make the right choices by eating healthy snacks before you go to a holiday party, so you don’t go overboard on sweets and unhealthy food choices. Try to stick to your workout regimen as much as possible. 9. Take a breather and make time for yourself. If you are feeling overwhelmed, take a walk, listen to your favorite song or get a massage. Take a break and do something for you. If you start to feel too much stress or anxiety, or you start to have difficulty sleeping, irritability or back pains, you might want to talk to your doctor or seek out a qualified therapist. Go ahead and enjoy your holidays by learning to recognize when you are feeling overwhelmed and planning a solution. Then you can find joy in the holiday season!